In an anti-globalization stance, Tamil Nadu trade associations and unions have declared war against foreign beverages. Effective March 1st, these Unions, and Associations representing thousands of traders from Tamil Nadu will stop selling Pepsi and Coca-Cola to the general public. The campaign against Pepsi and Coca-Cola is being spearheaded by two associations named Tamil Nadu Vanigar Sangangalin Peramaipu (trader’s collective), which claims to have 6,000 affiliated members and more than 15 lakh registered members; and Tamil Nadu Traders Federation. If we go back a bit, then we will find that Tamil Nadu Vanigar Sangangalin Peramaipu has been protesting against foreign brands like Pepsico and Kinley since 1998. However, consumer demand forced them to sell their products. If we believe some reports, then it seems that the recent (and ongoing) Jallikattu protests have triggered this new call for the boycott against ‘foreign’ companies. Combining the emotions generated while supporting Jallikattu and nationalistic feelings, this new wave of protest has been planned and executed. It seems that the months of January and February would be used to generate more awareness against the harmful effects of these beverages, and the actual boycott would start from March 1st. But Why Boycott Pepsi and Coke? There are mainly two reasons which are being used to mobilize support for this boycott against Pepsi and Coca-Cola. The first is that these brands are sucking away water from Tamil Nadu, at a time when Cauvery issue is rampant, and farmers are not getting enough water for their crops. And the other reason is the harmful effects of these cola brands on children. 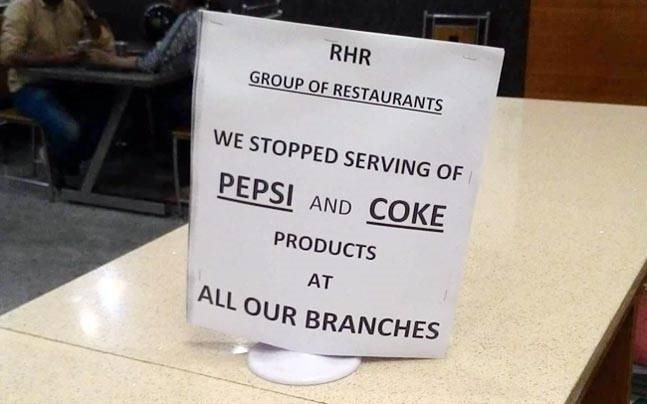 A few days back, it was reported that some hotels in Coimbatore have stopped selling Pepsi and Coke, in support of the boycott. Youth were seen smashing bottles of Pepsi and Coke during protests in Chennai and other locations as well. It would be interesting to see how Govt. reacts to this call for boycott, and how these MNCs handle this case. "Tamil Nadu Traders Will Stop Selling Coca Cola, Pepsi; Declare War against Foreign Beverages! ", 4 out of 5 based on 18 ratings. Patanjali: A Disruptive Force of Indian FMCG?